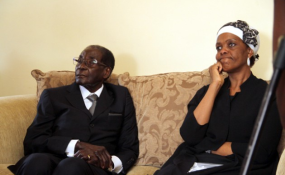 President Robert Mugabe's wife Grace has reportedly complained about how her family, businesses and allies were being treated since the fall of her ageing husband. According to The Zimbabwe Independent, although the Mugabes seemed to be quiet in the public domain, the former first lady has been complaining behind-the-scenes about how her family and the families of her allies' were being treated. In July this year, Grace reportedly moved to expand her Mazowe "empire" in Mashonaland province by grabbing the "iconic state-owned Mazowe Dam - almost a century after it was built - and surrounding tracts of land". The move at the tie heightened her "bitter fights with local villagers", who were barred from using the huge dam, as she also wanted to privatise it. Grace's empire included a huge double-storey mansion, a dairy farm, an orphanage and a school. She also had plans to build a university. Grace's allies and former cabinet ministers Jonathan Moyo and Saviour Kasukuwere who sought refuge at the Mugabe's house, the Blue Roof after the army intervention, had also left the country.